Today’s vibrant and unique citizenry—and an equally vivacious artistic atmosphere and legacy—have emerged from an astounding conglomeration of cultures and ethnicities. To those who know the area’s diverse immigrant origins, the iconic trolls of Mount Horeb seem to tell just one of many cultural tales. Yet this artistic examination through time illustrates that these grumpy figures are actually the end result of a complicated and rich multi-ethnic conversation. 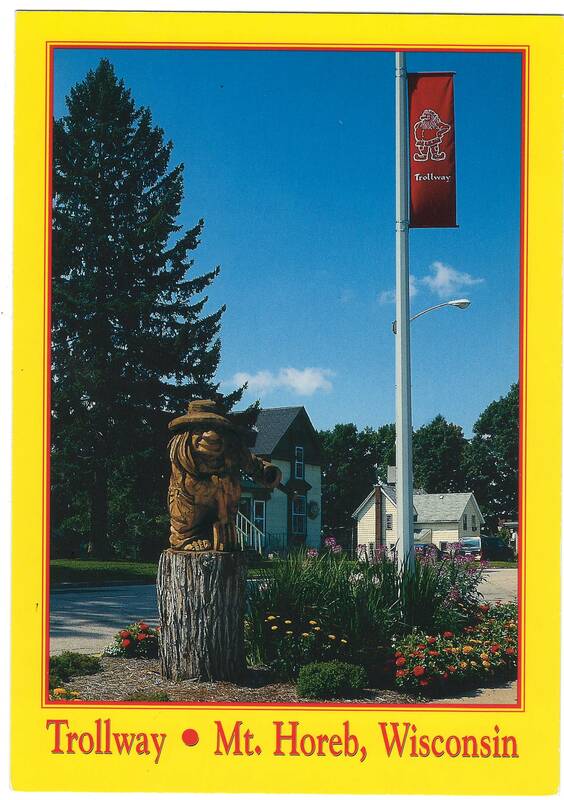 In an era when fast-paced urban development dooms many small towns to mainstream, cookie cutter suburban status, Mount Horeb’s trolls stand as protective sentinels and tangible reminders of the persistent importance of ethnic identities to the people of Southwestern Dane County. Promotional postcard from the 1990s. MHAHS Postcard Collection.